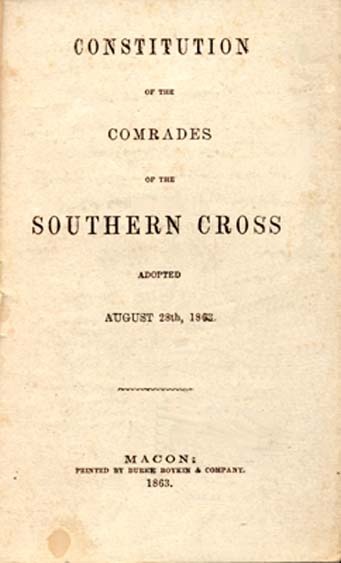 Comrades of the Southern Cross -- Constitution. Friendly societies -- Confederate States of America. 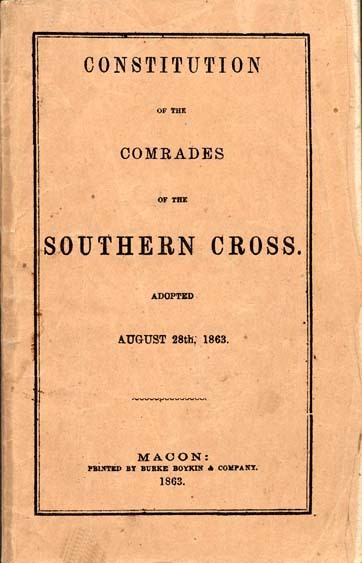 SECTION 1.--The subdivisions of "The Comrades of the Southern Cross" shall consist of "The Grand Encampment of the Confederate States of America," a "Corps Encampment" for each Army Corps, and the primary organization, to be styled a "Company." SECTION 2.--The officers of the Grand Encampment shall be a Commander, a Deputy Commander, an Adjutant General, with two Assistants, an Inspector General, with two Assistants, a Quartermaster General, a Provost Marshal General, with two Assistants, and a Chaplain, all of whom shall be elected from that body on the first day of April in each year, except the Assistants, who shall be appointed by the Commander. SECTION 3.--When two Corps Encampments shall have been organized, their officers, together with five delegates from each of those bodies, shall meet together, and organize the Grand Encampment, by the election and qualification of its Constitutional officers, who shall hold office until their successors are elected and qualified, under other provisions of this Constitution. SECTION 4.--The regular Assembly of the Grand Encampment shall be on the first Tuesday in April of each year, at such places as the Commander may seasonably announce, for the election of officers, and the transaction of all legitimate business presented: Provided, that, when the exigences of the military service forbid the Assembly of the Grand Encampment upon the regular day, the Commander shall announce the earliest practicable period thereafter for the Assembly, when all who are eligible by the Constitution, shall attend, and the proceedings shall be as valid as if transacted upon the regular day of the Assembly. SECTION 5.--The Grand Encampment shall be assembled at such other times as the Commander may think necessary; or when a majority of the Lieutenant Commanders may require it in writing, setting forth the object of the assembly, to which the deliberations shall be confined; but the call must be general to those entitled to attend. SECTION 6.--Each officer, before entering upon his duties, shall take an oath to support the Constitution of the Comrades of the Southern Cross, and the By-Laws of the Grand Encampment, and faithfully and impartially to discharge all duties incumbent upon them respectively. The officers first commissioned shall be sworn by the senior Comrade present, and those subsequently elected by the ranking retiring officer present. SECTION 8.--A majority of those present shall decide all questions, except as herein specially provided. The presiding officer shall be entitled to a vote, and shall also decide all questions where the vote is equally divided. SECTION 9.--Until the organization of a Corps Encampment in an Army Corps, the Grand Encampment while sitting, or the Commander in vacation, may authorize the organization of Companies within that jurisdiction, according to the provisions and restrictions herein contained for Corps Encampments and Lieutenant Commanders. SECTION 11.--Each Corps Encampment shall pay to the Grand Encampment one hundred dollars for its commission; and forever afterward ten per cent. of its revenues, to be forwarded with the annual returns. SECTION 12.--Should the offices of the Commander and the Deputy Commander both, from any cause became vacant, the senior Lieutenant Commander shall be ex officio Commander. SECTION 13.--The Commander may commission any worthy Comrade to introduce this Order into distant Departments, Districts or Detachments of the Army. The Comrade so commissioned may select seven soldiers or officers, and after administering the obligation to them, may commission them to organize a Company. But after five Companies shall have been organized in an Army Corps, the commissioner above named shall have no further authority to organize Companies in that jurisdiction. SECTION 2.--The officers of the Corps Encampment shall be a Lieutenant Commander, a Deputy Lieutenant Commander, an Assistant Adjutant General, an Assistant Inspector General, an Assistant Provost Marshal General, an Assistant Quartermaster General, and a Chaplain, to be elected from that body on the first Tuesday of February next succeeding the issuance of commission, to succeed those named therein, and forever afterward on the same day of each year They shall hold office for one year, or until their successors are elected and qualified. SECTION 3.--The Lieutenant Commander shall preside at all the assemblies of his Corps Encampment, issue commissions for new Companies, and call all extraordinary assemblies. The Deputy Lieutenant Commander shall assist the Lieutenant Commander when present, and shall discharge his duties when temporarily absent or inaccessible. The temporary absence of both shall be supplied by the senior Army officer present, who shall continue to discharge the duties of Lieutenant Commander during the adjournment, until the return of one of the officers above named. The duties of the other officers shall be the same as those of similar officers of the Grand Encampment. SECTION 5.--The jurisdiction of a Corps Encampment shall be confined to its Army Corps; and, after its organization, it shall have sole authority to commission new Companies therein, to try all cases coming before it by appeal from the Companies of its jurisdiction, and to instruct its delegates to the Grand Encampment. SECTION 6.--Upon the petition in writing of seven Comrades of that jurisdiction, vouched for by two others of well ascertained standing, asking for the organization of a Company in any Regiment, Battalion or Independent Company of that Army Corps, setting forth in the petition the names of the officers desired, the Corps Encampment, at a regular assembly, shall issue a commission to the officers named in the petition for the organization of the Company: Provided, that the Regiment, Battalion or Company in which the organization is sought has no other Company within it of less than one hundred and twenty-five Comrades, and has at least seventy-five men on its muster rolls. SECTION 7.--The Lieutenant Commander, or the officer discharging the duties of that office, may, in vacation, authorize the organization of a Company by appointment, under the restrictions of other Sections of this Constitution. But such appointment must be substituted, at the next regular assembly, by a commission dating to the appointment, otherwise the Company so organized shall cease to exist. SECTION 8.--The officers originally commissioned shall hold their offices until their successors are elected and qualified. SECTION 10.--Voting shall be by ballot, except upon mere questions of order, and a majority of those present shall decide, except as otherwise specially provided herein. The Lieutenant Commander, or the officer discharging his duties for the time being, shall be entitled to a vote, and shall also give the casting vote in case of a tie. SECTION 11.--Should the offices of the Lieutenant Commander and Deputy Lieutenant Commander both, from any cause become vacant, the senior Captain in that Corps shall become ex officio Lieutenant Commander. SECTION 12.--Each Company shall pay to the Corps Encampment twenty-five dollars for its commission, and forever afterwards ten per cent. of all its revenues. SECTION 1--Companies of each Corps Encampment shall be designated numerically according to the dates of their commissions. For each Company there shall be one Captain, one Lieutenant, one Orderly Sergeant, one Assistant Quartermaster, one Assistant Inspector, one Assistant Provost Marshal, and a Chaplain; who shall be elected annually, and shall hold their offices until their successors are elected and qualified. SECTION 3.--In the absence of the Captain the Lieutenant shall perform his duties. In the absence of both, any Comrade present may be called, by a majority of those present, to discharge the duties. SECTION 4.--The Orderly Sergeant shall record the proceedings of the Company, and issue all orders and summons as directed by the Captain. SECTION 5.--The duties of the Assistant Quartermaster, Assistant Inspector and Assistant Provost Marshal, shall be similar to those of the corresponding officers of Grand and Corps Encampments; and in addition thereto, it shall be the duty of the Assistant Inspector to examine, and, when necessary, instruct all candidates for membership; present them for initiation, and conduct them throughout the ceremonial. SECTION 6.--The Chaplain shall open and close the assemblies with prayer, and shall perform such other duties as may be appropriately required of his calling. SECTION 8.--After a Company shall have been organized within a Regiment, Battalion or Independent Company, the officers and men of that command are prohibited from membership in any Company in any other command; and the same rule shall apply to General and Staff Officers within their respective commands. Two or more Regiments temporarily consolidated shall be considered as one Regiment. SECTION 9.--The initiation fee shall be twenty-five dollars for General Officers, fifteen dollars for Field Officers, ten dollars for Captains, five dollars for Lieutenants, and two dollars for Privates. SECTION 10.--A Company shall consist of not more than one hundred and twenty-five Comrades, including its officers. It shall assemble weekly for the first three months after its organization, and once every month thereafter. SECTION 11.--A second Company shall not be commissioned within any Regiment, Battalion or Independent Company, until the first shall have attained its numerical maximum; and the same rule shall obtain in the issuing of subsequent commissions. SECTION 12.--Any member in good standing, who is not in arrears, may demit at a regular assembly, upon application in writing presented at a previous regular assembly. But the effect of the demit will only relieve such member from active membership. SECTION 13.--No Company shall be organized except under a commission from either the Lieutenant Commander of the Corps of jurisdiction or the Commander of the Grand Encampment, unless by special appointment, and any Company presuming to organize upon any other authority than that above named will not be recognized, nor will its members be admitted into other Companies either as Comrades or visitors. SECTION 14.--In addition to the initiation fee and monthly dues, each member shall contribute one half of one month's army pay annually for two years, the first instalment to be paid within one month from the date of his initiation, and the second twelve months thereafter, which shall constitute a Charity Fund, for the relief of the wounded and disabled Comrades of the respective Companies in which the fund is created, and for the relief of the indigent widows and orphans of such Comrades as may lose their lives in the military service of the Confederate States. SECTION 15.--The Charity Fund created under the provisions of the foregoing Section shall be distributed by appropriate committees of the respective Companies under such orders and By-Laws as may be enacted. SECTION 16.--All vacancies in the Company offices shall be filled by election at the next regular assembly after they occur, and the officers then chosen shall hold until the next regular annual election, and until their successors are elected and qualified. But until the vacancies are filled the senior Army officer of the Company shall act as Captain, and shall temporarily supply other vacant offices by appointment. SECTION 18. - All offences, except those named in the preceding Sections, shall be punished by expulsion, suspension, or otherwise, according to the nature and degree of the offense. SECTION 19.--When charges shall have been preferred against a Comrade, the Captain shall appoint a committee of three, who, together with the Assistant Provost Marshal, shall investigate and report upon the charges. If then further investigation be deemed necessary, a committee of five shall be appointed, who will ascertain and report all the material evidence on both sides in writing, in all cases giving the accused reasonable notice, so that he can, if he wishes, cross-examine the witnesses. When the report is made, the charges shall be tried by the Company at a regular assembly. SECTION 20.--Upon transfer of a Regiment, Battalion or Independent Company, in which there may be a Company or Companies of this Order, such transfer shall operate as a change of jurisdiction and representation. SECTION 1.--This Constitution and the ceremonials and obligation may be amended, modified or changed by a vote of two-thirds of the Comrades present at a regular assembly of the Grand Encampment, when the proposition is presented for final action. But it must be made at a previous regular assembly, when a vote of two-thirds of those present shall be necessary to permit a consideration of the change or amendment; and exact copies of the proposed change must be submitted at least six months before final action, to every Corps Encampment, and through them to every Company in their respective jurisdictions, with notice of the time when the proposition will be considered by the Grand Encampment. The meeting of an Encampment shall be begun by reading some portion of God's holy word--Singing and prayer. Then shall the Chaplain use one or more of the following prayers--always including the Lord's prayer--which should be repeated aloud by all, and ending with--The Grace of our Lord. Direct us, O Lord, in all our doings, so especially in these our deliberations-- with Thy most gracious favor, and further us with Thy continual help; that in all our works begun, continued and ended in Thee, we may glorify Thy holy name; and finally, by Thy mercy, obtain everlasting life, through Jesus Christ our Lord. AMEN. O, Almighty God, the supreme Governor of all things, whose power no creature is able to resist, to whom it belongeth justly to punish sinners, and to be merciful to those who truly repent; save and deliver us, we humbly beseech Thee, from the hands of our enemies-- abate their pride, assuage their malice, and confound their devices; that we being armed with Thy defence, may be preserved evermore from all perils, to glorify Thee who art the only giver of all victory; through the merits of Thy Son, Jesus Christ our Lord. AMEN. us, to pray Thee to lift up once more the light of Thy countenance upon us, and to bless us and our arms. Save us, we humbly beseech Thee, from the hand of our enemies, and send Thy fear before us, that our enemies may be confounded at Thy presence. The race is not to the swift, nor the battle to the strong, but our trust is in the name of the Lord our God. Hear us, O, Lord, for the glory of Thy name and for Thy truth's sake, through Jesus Christ our Lord. AMEN. "Praise God from whom," &c.
Unto God's gracious mercy and protection we commit ourselves, and the cause in which we are engaged. The Lord bless us and keep us. The Lord make His face to shine upon us, and be gracious unto us. The Lord lift up His countenance upon us, and give us peace both now and evermore. Though the oracle be seal'd.